There lurks on the London Underground network a tube station that wont appear on any tube map, past, present or indeed future. In use on most days, yet no trains ever call there and no passengers ever use it. Fully fitted out with Oyster card readers, signalling and display boards, it isn’t an old abandoned station. Welcome to West Ashfield Tube Station. 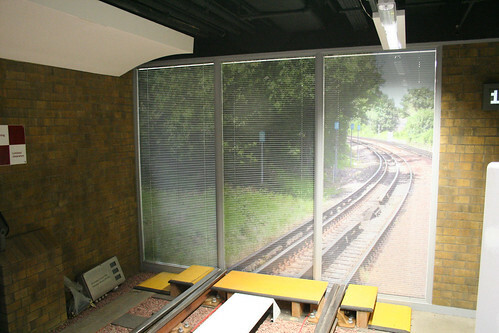 This is in fact a fully fitted out fake tube station built by London Underground on the 3rd floor of an office block in West Kensington and is used to teach new employees what goes where and when. It is slightly surreal to go into a fairly generic office building, then on the third floor, find the entrance to a tube station – complete with fake newspaper stall and wire mesh grills. The whole floor is used for training staff, and I was able to attend a tour of the facilities thanks to the The Institution of Engineering and Technology – The IET. 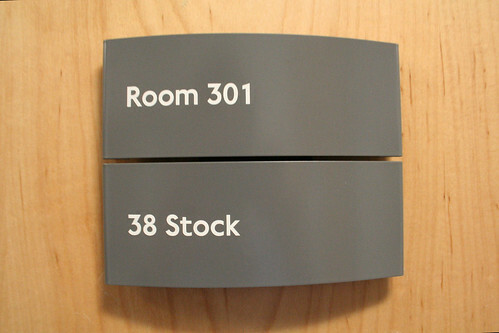 Despite the presence of the mocked up tube station, the rest of the floor is made up of conventional office rooms, although in a nice touch, each room is also named after a former tube train stock number. 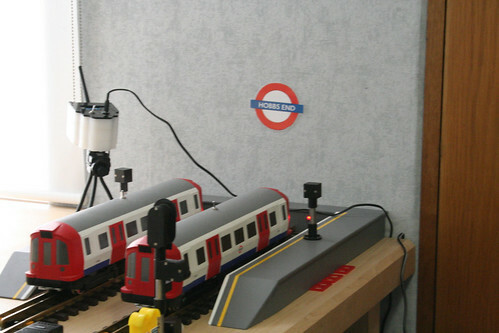 Our group was broken up into four groups for convenience, and the tour covered the tube station, the new S-Stock simulator and a fully functioning model railway. We also got to play with some of the “big boys” toys. The tube station is probably the highlight for any visitor and in addition to looking like a tube station, it also behaves a bit like one. When a train is due to arrive, although no physical train appears, the platform rumbles, speakers drown out conversations and there is even a fan in the corner blowing to simulate the wind blast that heralds the arrival of the train. We were given a quite in-depth introduction to how the signalling systems work based on the “moving block” system the tube uses at the moment, with a brief overview of the system being introduced on the Jubilee Line at the moment. 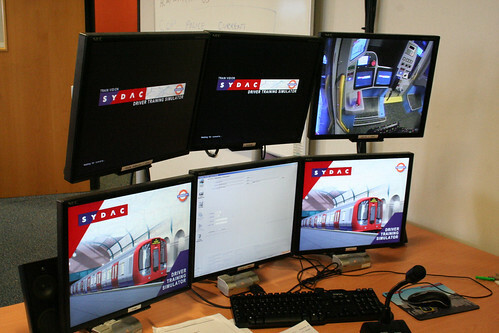 Most pertinent was how the tube network deals with faults – and what causes them. 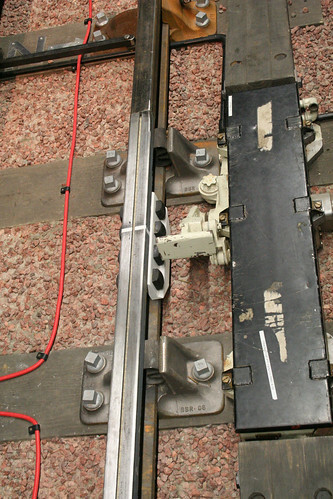 For example, there is a small break in the running rails which acts as a signal isolator, but over time that gap gets filled in with metal filing from trains, and the signal breaks. Sometimes, simply scuffing the surface with your shoe is what it takes to fix a signal. Which is why sometimes signal failures last just a few minutes before magically vanishing. However, as we were to later learn, sometimes a signal failure in the wrong place can be a nightmare and totally screw up the network for several hours. 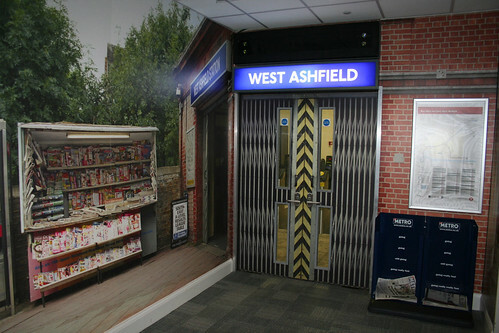 Incidentally, West Ashfield station is indeed in the western wing of the office block. Maybe there’ll be an East Ashfield station sometime in the future? After a quick overview of the trainers own operations desk, it was time to play with the train itself. Several members of the group got to play at being train driver – driving through Red Lights at Danger (SPADS) with alarming regularity. I didn’t actually get to drive the train, but (in my opinion) probably got the better part of the deal by standing outside and chatting to the instructor and getting much more background information. Quite interestingly, although a SPAD is not a good thing, in of itself it isn’t mission critical. Due to the nature of the tube network signalling systems, SPADS are almost guaranteed, and the tube network only takes action if someone is rather incompetent and keeps passing red signals. As a SPAD could be a signalling failure and not the drivers fault, the driver seeks permission to drive carefully after each incident and after 3 minutes, returns to driving at normal speed. The new S Stock automatically limits the speed for three minutes, then releases the driver to go at full speed again. 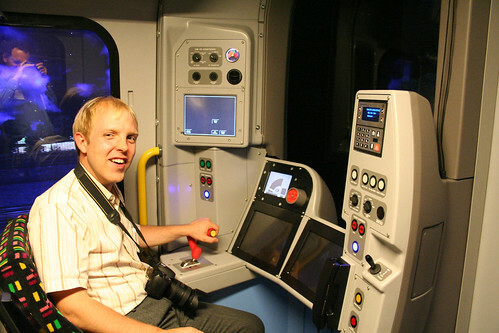 The new trains also have some interesting improvements, such as if someone has got a bag jammed in a door because they jumped on when the doors are closing, then the train will only open that one door rather than all the doors on the train – which usually results in more people leaping on (and getting stuck between closing doors). Incidentally, standing outside the simulator as the train starts moving forward is a very unsettling experience as you see the scenery moving, but don’t feel the usual sensation of a train accelerating. Takes a bit of getting used to as your brain gets confused by the illusion of moving without moving. A brief talk about how they use a static model railway to set up possible scenarios and teach tube staff how to handle situations. Then on to the ultimate model railway. 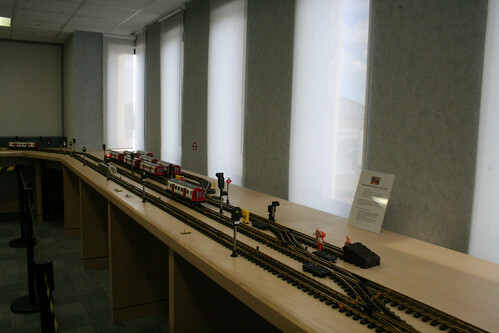 This is a fully functioning model railway that was only recently built to replace an older model based in White City many years ago. 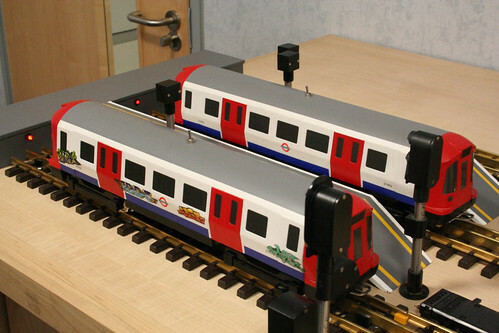 That older model used signalling systems that were so close to the live kit, that sometimes an engineer would run in and nick a component to fix a broken signal at White City! That’s not going to happen with the new model train set. 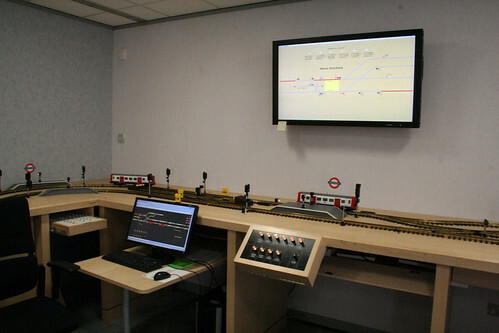 In addition to being configured with a selection of more modern signalling systems as used on the London Underground, they also have a lovingly recreated old lever based signal network which is used to show staff how things worked in the past. We were then let loose on the system and told to basically run the the network, getting trains into platforms, slidings etc without causing traffic jams and the like. The true purpose of the model train set though is to train staff on dealing with problems, and a simple flick of a switch can simulate any sort of network failure you care to imagine. It was here that we leant why it can sometimes take ages to get trains out of tunnels when things go wrong. For example, a train is stuck at a platform – maybe someone decided that 5pm was the best time to kill themselves – and there is a train behind it in the tunnel. Not only does that train now have to reverse back down the tunnel – but do so safely. 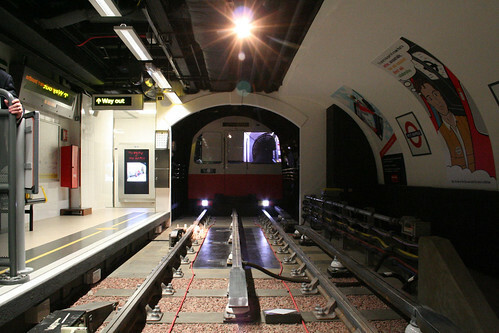 In ye olde days (aka, 2008) the station staff at the previous station would have to manually check any points junctions were safe, but then walk down to the stranded train and hand over a paper form granting authority for the driver to drive backwards down a tunnel. Today they can grant authority over a secure radio link, but that only became possible 18 months ago. Indeed it does seem that the Evening Standard headlines of people being stuck in tunnels for an hour or more have dried up since this was introduced. So, a change that many people wont have even known has happened has already had a positive impact on reducing delays on the network. Oh, and I slightly squealed when I noticed one of the stations is called Hobbs End. Sci-Fi film geeks may get the reference. Overall, a fascinating visit and I am deeply grateful to both the staff at London Underground for taking us around (and letting us take photos! ), and also to the IET for organising another excellent event. More of my photos from the visit here. Where were all the sweaty tourists and used copies of the Metro? That’s all pretty damn cool – I had never even thought that such a place may exist! So need to feed my tube addition soon. Awesome! Found this post through the LDN twitter, and love it! Hobbs End – looking at that black and white thing above the trains, I think they’ve landed again! The existing system is fixed block. “Moving block” is the new system*. I can always be guaranteed to get some of the terminology wrong somewhere. Thanks. Did you touch your Oyster on the reader? If it was PAYG, did you get charged the full price as you didn’t touch out after? Great blog! Fascinating – thank you. I used to keep applying for a pass to visit the old Down St station but never made the shortlist. Will you go there too and tell us what it’s like? I didn’t like your example about “5pm was the best time” – Couldn’t you give a general example instead? Cindy B I think he meant that 5pm was a good example as it would be the time when most delay could be caused to the Tube system, being that it would be in the rush hour. Could have easily have put 8.30am. Splendid stuff! I had heard on “The Grapevine” a year or so ago, that such a place did exist, and here it is! Thanks for taking the time to bring it into the ether! does it show where to hide from customers when there are loads of problems such as signal failures? I would like to request you kindly give or tell me the entire history of Underground Trains such as How it was made , how much energy (electric Power) its required and many other informations because I am an University Student and I have to summit the assignment on underground Trains history. If this is a university assignment, you need to do your due diligence with proper research instead of relying on the generosities of bloggers to help you in your school work. This isn’t highschool. Nice article. I thought it is about some sort of secret military(?) station before reading the article. It’s not. Was not disappointed tho. saddest thing I have ever seen. poor people. I too shall nitpick though it’s only a teeny error and you’ve done amazingly well to retain all that knowledge long enough to blog it! If we pass a signal at danger then the timer restricting the train’s speed lasts for three minutes but the driver may still be required to drive at <9mph for quite a while after that. The rule they hammer into us is "for two stop signals (i.e. that have a trainstop) at green or yellow". The reason why we do it for that long at slow speed is to make sure that there is definitely no other train still close enough in front that we could run into it. But that's a tiny nitpick in an otherwise fab blog. Back in 1962 when I first started on London Transport, they had a similar layout, (although not as up-to-date as 2010 obviously), at White City, opposite the BBC TV Centre. 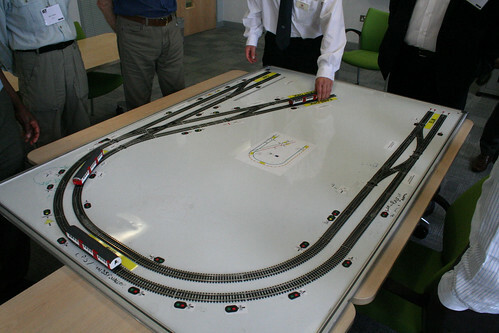 It was the London Transport Railway Training Centre. It was, of its day, quite technical and was also used as a training device. It had larger rolling stock, an electronic diagram, and a small lever signal frame. But that was then and this is now, and you’ve done a remarkable job reporting how this training environment operates. Adrian, I remember the layout at the White City Training Centre when I did my Guard training in 1976 ( & Motorman training in 78 ). The Stations on the layout were ‘Oak’ & ‘Ash’. Slightly deviating from the article, my Guard & Motorman exams were taken by ‘Nobby’ Clark. You were filled with terror if you knew he was taking the exam. If you knew your stuff you were fine, if not….I saw grown men reduced to tears! Was he there in 62? I love the underground and a bit of a tube geek myself. Interesting read. Great insight in to the station and a great place for training. We once went to a closed underground station and I have to say it was quite an experience. Good blog post! I found it interesting since I love visiting London and using the Underground, but the last time I been to London and used the Underground was January 2005. We have a Underground-type network in the city I live in. I live in the North East in Newcastle Upon Tyne and our Underground network is called Metro. The trains here have been updated along with the platforms, all neatly tidy and they all have a new design and layout, which I’m impressed by. Our city uses the old London Underground tickets (you know, the orange and green tickets) which frustrates me. Why can’t they just allow us to use Oyster Cards, makes things easier to swipe on the buses and trains – would be useful to get around cities nowadays. On what you said, I might check London out again. Does the IET let people (like me, who is disabled, for example) have fun and learn new things too at that West Ashfield Road Station? If so, please email me back. I have a unique and rare Autistic Spectrum Disorder (ASD). 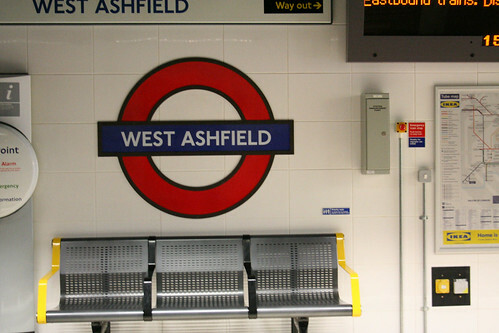 11 Pings/Trackbacks for "West Ashfield – London Underground’s “secret” tube station"